Smartphones have grown to be an average man's greatest companion and sometimes life saver, but if necessary precautions are not taken it can turn out to be man's biggest enemy. Today's smartphone is equipped with lots of new features and upgraded hardwares which makes them a lot more powerful and equally more dangerous. There are few tips online that can help keep you safe when charging it such as: don't make calls when your phone is plugged and also don't plug your phone very close to you when sleeping as it might lead to death just like it did to a teenage Vietnam girl this week. 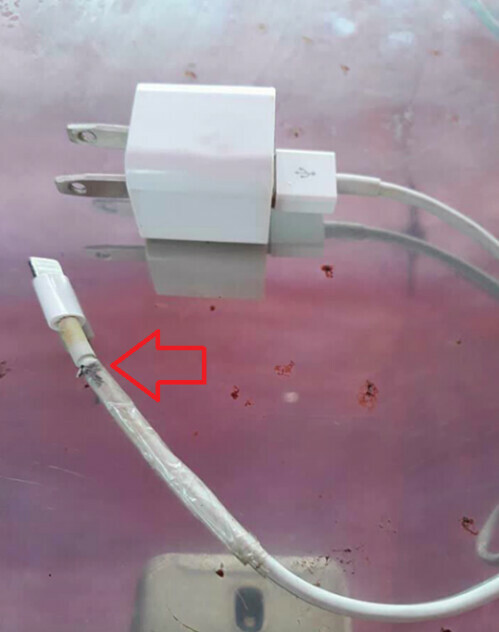 A 14-year old girl in Vietnam was electrocuted in her sleep by a frayed charging cable that was plugged into her Apple iPhone 6. According to the Police, the girl who goes by the name Le Thi Xoan plugged her iPhone with the official Apple charger and laid it on her bed. She unknowknlg rolled in her bed while sleeping onto the exposed cord of her charger cable and was electrocuted. Although her parents quickly rushed her to hospital when they realized she was unconscious the next day but she was pronounced dead on arrival. It's advisable you check for any exposed part on your smartphone cable irrespective of the type of phone you are using, also try to go for original chargers/cables and stay away from the cheap ones.